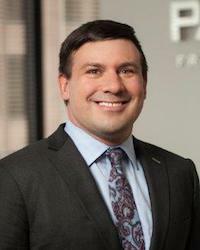 Jeremy Fetty joined the firm in 2006. Mr. Fetty is currently on the Management Committee and Chair of the firm’s Utility and Business Section. Mr. Fetty’s practice focuses on utility law including energy, communication services, telecommunications, gas, water and waste management; corporate law; cooperative law; and right-of-way law. Mr. Fetty advises businesses and utilities (for profit, non-profit and cooperative), on regulatory, day-to-day contract and transactional matters, and compliance issues. Mr. Fetty regularly advises businesses and utilities on matters such as Indiana Utility Regulatory Commission (“IURC”) matters, Federal Energy Regulatory Commission ("FERC") matters, Federal Communications Commission (“FCC”) matters, and Independent System Operator ("ISO") and Regional Transmission Operator ("RTO") matters. He has represented clients in FERC proceedings related to market based tariffs, formula rate tariffs, transmission, compliance, mergers and acquisitions/dispositions, rates and terms for wholesale electric service, qualifying facilities issues and standards of conduct and affiliate relationships, PURPA issues, electric and capacity market issues and RTO participation, particularly Midcontinent Independent System Operator, Inc., and PJM Interconnection. Mr. Fetty regularly represents utilities in various IURC proceedings related to energy, telecommunications, sewer, water and gas. He also regularly represents utilities with right-of-way issues, including railroad crossing issues. Prior to joining the firm, Mr. Fetty worked in Detroit, Michigan, where he spent three years with the Michigan Court of Appeals, first as a research attorney then as a clerk to the Honorable Kathleen Jansen. While in Michigan, he assisted a Special Master in determining individual damages in a 42 U.S.C. § 1983 class action claim against the City of Detroit and assisted a well known arbitrator in the drafting of labor and employment arbitration opinions. Mr. Fetty is admitted to practice law in Indiana and Michigan, the United States Court of Appeals for the Seventh Circuit, the United States Court of Appeals for the Sixth Circuit, the Southern District of Indiana, the Northern District of Indiana, the Eastern District of Michigan, and the District of Columbia Court. International Municipal Lawyers Association. Mr. Fetty is a former Chair of the ISBA Utility Law Section. Mr. Fetty is currently serving as a board member and President of the Board for the Indiana Cooperative Development Center. He also serves on the legal committee for the National Telecommunications Cooperative Association. Originally from Frankton, Indiana, Mr. Fetty was a four-year varsity wrestler at Manchester College and an Academic All-American. He served as managing editor of articles for the Michigan State University Law Review. Mr. Fetty is also an eagle scout. From 2010 through 2017, Jeremy was selected as an “Indiana Super Lawyers Rising Star” in the field of Utility Law. Candidates for Rising Stars must be 40 years old or younger and have been in practice for 10 years or less and are selected following peer nomination and an independent research process conducted by Law and Politics Magazine. Approximately 2.5 percent of lawyers in the state receive this distinction.